After quietly separating itself from Ultimate Ears, Logitech is finally and once again making portable Bluetooth speakers under its own name. Logitech recently introduced the X300 Mobile Wireless Speaker, the exuberant stereo variant of the company's ultra-small and pocket-friendly X100 offering. Though unlike the X100, the larger X300 is not only a stereo wireless Bluetooth speaker, but has four times as many drivers to help produce richer and more powerful immersive sounding audio whilst still maintaining that highly portable form factor we so very much like. Last week we tested and put JBL's small, albeit very capable $50 pocketable Clip speaker up against Logitech's comparable X100. Although the Clip has narrowly won that battle, we are even more interested to find out if paying an extra $20 is worth overlooking both of these very small speakers in favor of a superior music experience. Better yet, can Logitech's performance-driven X300 Mobile Wireless Speaker beat its Ultimate Ears cousin? Let's find out! If you wanted to know what a little extra money can get you then you'll be happy to know the X300 is the new $70 step up offering you've been unknowingly waiting for all this time. But in order to get down to this point, Logitech did have to cut down on some of the luxuries and enticing product packaging. No over the top packaging wrap job or any fancy accessories here. Everything about the X300 is basic, except for its appearance that is. And neither does it lack performance might I say. It may only come with a micro-USB charging cable and nothing more, but it's not like you're paying through the nose for it. The X300 is an inexpensive mobile Bluetooth speaker at $70, however, it is everything that Logitech put into discontinued (albeit rebranded with the Ultimate Ears name) Mobile Boombox, which retailed for $100 and continues to cost as much under its new UE Mini Boom moniker. 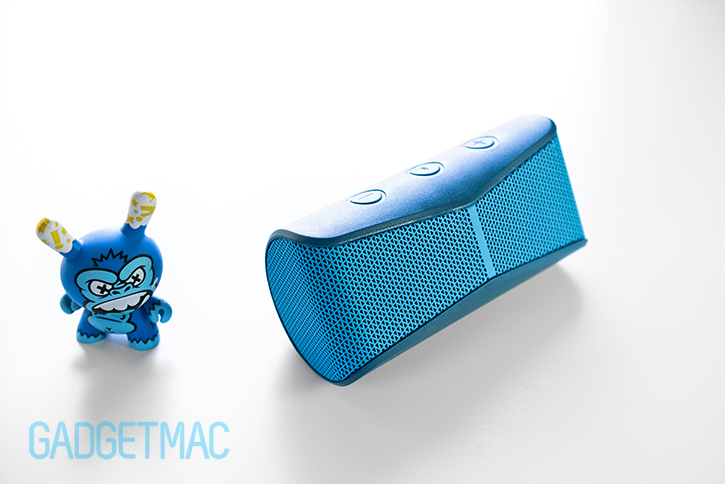 For that you're getting a very capable little speaker that's well designed, and comes in a multitude of vibrant colorways similar to that of the UE Mini Boom by Ultimate Ears. 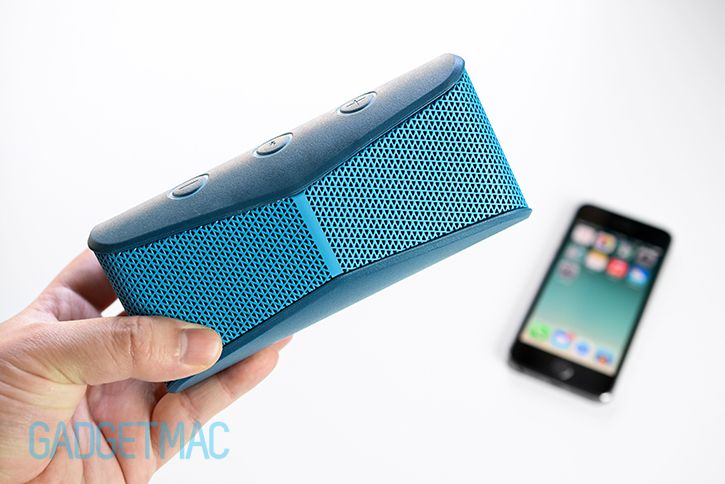 Portable Bluetooth speakers these days are now more than ever a popular accessory for on-the-go music entertainment. The amount of options are seemingly never ending with more new offerings being released every day. And of course now that every company wants to stay fresh and stand out in unique ways instead of replicating Jawbone's iconic block-shaped form factor, many newly released portable wireless speakers now come in a wide variety of sizes, shapes and price points. And Logitech's X300 is a prime example of that diverse selection of speakers. Its shape cannot be defined with a single word. It is not round, hexagonal, squared or cylindrical in any way. The X300 has an original design that bends at the back to form an angled stand for the speaker to output it's sound at an upward tilt, it's half rounded around the sides and has an aggressively looking curvature at the front with a brilliant display of zigzagging patterns across a metal grille which wraps around the side edges. It's tastefully modern and obviously a very unique looking flowing design we would expect to see having the Ultimate Ears branding on instead. It's no secrete Logitech owns the UE brand, and it's obvious that the two jointly developed the X300 from the inside out. 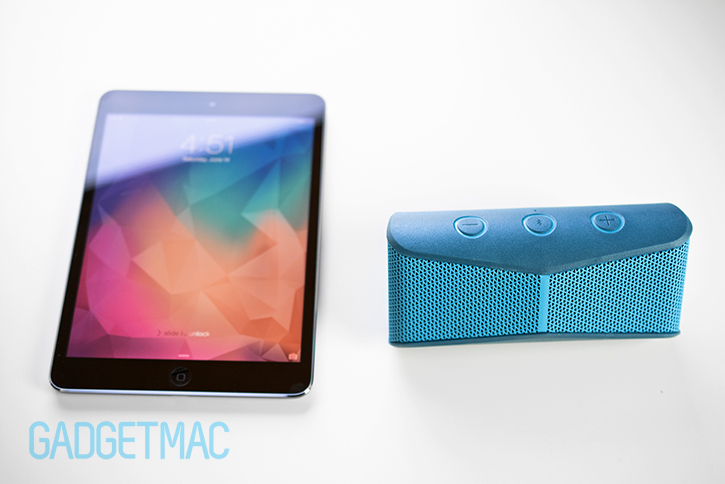 With such an impressive speaker offering like the UE Boom, that's fine by us. The X300 is one of the more eccentric Bluetooth speakers available, and we like that about the X300. Pro tip: flip the X300 upside down (top buttons facing down) to get a higher degree upward tilt. Useful for when you find yourself at a situation where the speaker is placed right next to you so that you can get a better directional hearing output. Of course with nothing at the back, the X300 is not capable of producing a 360-degree sound, but only a front-facing output of audio. Althought Logitech's X300 isn't as compact or as cheeky as the UE Mini Boom, we think that Logitech did a brilliant job not only designing it, but reducing the cost without sacrificing audio quality one bit. The only thing that we don't like about the X300 is its battery life. You'll get up to 5 hours depending on how loud you listen to music, which is not impressive at all. We expect extended battery performance in recently released portable speakers, not the opposite. Is that too much to ask? Apparently so. At least notable companies like Fugoo and JBL know what we're on about. Like the X100 and UE Mini Boom speakers, the X300 is pretty basic when it comes to controls. It features tactile circular integrated controls at the top which include a multi-function Bluetooth pairing button in the center, flanked by volume up and down buttons. With the middle multi-function button you can pair your devices together, answer and end a call as well as play and pause music. Unfortunately, you won't be able to skip tracks using the buttons on the X300 nor can you check up on the battery status. There's also a built-in mic located near the buttons on the top which enables you to use the X300 as a wireless mobile speakerphone; and it works extremely well. Our caller on the other end heard us loud and clear even while we were talking from as far as 5-feet away. It picks up voice surprisingly well. So as a speakerphone, the X300 is impressively great. When first powering on the speaker, a simple generic welcoming sound will play on startup which isn't as spectacularly unique as the guitar strumming effects embedded into the UE Mini Boom and Logitech's older UE Mobile Boombox alike. The speaker will automatically turn itself off instead of going into a sleep or standby mode if its not active. This means that once it turns off, it will not instantly wake up when it senses audio streaming from your device like the UE Mini Boom does. You will need to power it on manually. Though fortunately, the X300 does reconnect instantly with a last paired device using Bluetooth. Around the back, you'll find that the X300 has a seamlessly integrated power on/off button with a small blue LED light next to it, as well a micro-USB charging port and a 3.5mm auxiliary input port for use with devices that have no Bluetooth support. Usually when a wireless speaker features a 3.5mm input, it also comes with an audio cable in the box, however, the X300 doesn't include one. Pairing the X300 is a quick and an effortless process as it should be. The X300 supports A2DP and HFP 1.6 Bluetooth audio streaming and speakerphone profiles. That means you can pair two devices at once or up to 8 different devices which the X300 will memorize and will quickly connect to. Also, there's no lag between video and audio playback when paired over Bluetooth so you can watch movies, videos and play games as if you were hardwired. But unlike Logitech's UE Mobile Boombox and the Ultimate Ears UE Mini Boom, you cannot tap to pair with NFC-enabled devices using the X300. Battery life is somewhat short and you'll get around 5 hours if you don't continuously play music at full volume. Even though there is a difference in price, we would have liked to at least have the same 10-hour battery life of the smaller UE Mini Boom in the X300. The built-in rechargeable battery can be recharged on the go over USB using your laptop or even an external battery pack with enough juice or by directly plugging it into a wall socket. The X300's build quality is identical to that of the UE Mini Boom with the use of a rubberized layer sandwiching a metal speaker grille, however, it does feel substantially more durable with its thicker rubber cladding that's weighty and sturdy enough to be called extremely solid and not at all plasticky. Though neither does the X300 have a premium quality to it. 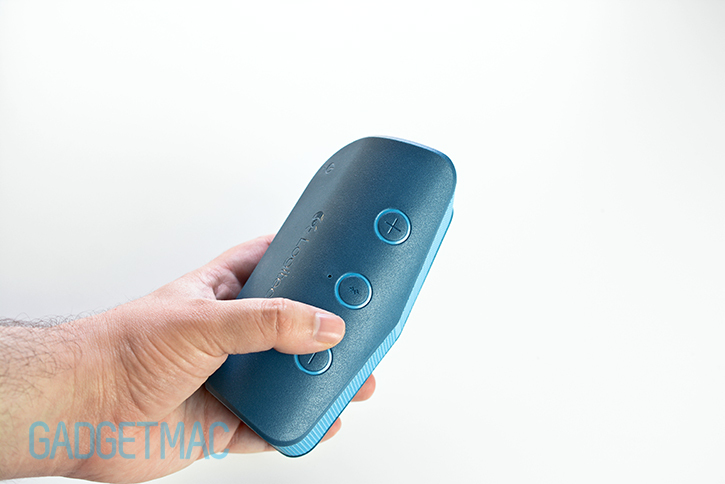 Like the UE Mini Boom and X100 speakers, there are buttons seamlessly integrated into the rubber layer. But unlike the ones on the UE Mini Boom, these have more definition and are more pronounced in contrast with the rest of the rubber surface that they protrude out of. It's safe to assume that the X300's body itself is constructed out of plastic and is surrounded by this rubberized layer that not only adds durability and self protection against the occasional drop and tumble, but also provides an ample amount of traction that keeps the speaker in its place even when playing music at the highest sound level. It's also worth nothing that the surface finish is not as sleek as it is on the UE Mini Boom. Instead, it feels and looks granular by comparison. Not that it really makes much difference in usability or even quality, but it does not pick up lint and dirty as easily as the smoother textured rubber material that encases the UE Mini Boom. We do think that the X300 will hold together acceptably well under heavy use, being tossed inside your bag or just handed over to careless friends. The one thing we would have liked to have is some kind of water-resistant protection. The Logitech X300 and Ultimate Ears UE Mini Boom may sound similar to one another being that they are close relatives, but the X300 steps it up one more notch with a noticeably thicker and tighter sounding low-end and a fuller bass response overall thanks to its two (albeit still small) opposing side-firing bass radiators, which make the UE Mini Boom's bass sound weak and imprecise by comparison. Another significant improvement as a result is the X300's midrange, which isn't as muddy and is more comprehensive. Other than that, the X300 delivers a very bright and clear high-end that sounds just as good as it does coming out of the UE Mini Boom. It's still not nearly as powerful and as impressive sounding as the more expensive and capable ($200) UE Boom though. And to be fair, we never expected it to sound as good costing just $70. Needless to say, no real surprise there. The X300 may not have a built-in carabiner clip nor will it fit into your pocket as discretely as the JBL Clip without leaving a massive "look here" bulge in your pants, but what it doesn't lack is the ability to produce a more desirable and powerful sound quality. Unsurprisingly, the X300 is loud enough that it will fill up a very large living room-sized space with undistorted sound at maximum audio output. A bit more volume power would hurt though as we did find using the X300 near or at its full volume capability most of the time. As it turns out, paying more does not necessarily mean a better sounding device. The X300 without a doubt outperforms the more expensive $100 UE Mini Boom, as well as the noteworthy JBL Flip – but not by a landslide. Still, it does deliver a richer and more dynamically complete audio experience without really taking up considerable amount of extra space in return. However, if we must take battery life into consideration then we would have to pick the UE Mini Boom as the winner in that regard thanks to its 10-hour battery life and useful features like the ability to pair two speakers at once to create a more powerful sound system on the go. The Logitech X300 delivers great audio for less money, but lacks that extraordinarily good battery life we were hoping for. That being said, if paying less for a better sounding portable speaker means you'll be much happier, then we think Logitech's X300 is the one speaker that comes out on top. With a resilient build quality, small packable size, stylish curved body and above average audio performance at a relatively reasonable price, Logitech's X300 Mobile Wireless Stereo Speaker is too good to pass up. For that reason, we can highly recommend it. It's the excellent choice if you're looking to get your first portable Bluetooth speaker and are on a $100 budget. Let's say you happen to have a larger budget and you're looking for the absolute best and truly portable wireless speaker with epic rich sound? Then have a look at the Bose SoundLink Mini and how it stacks up against the mighty UE Boom from Ultimate Ears.